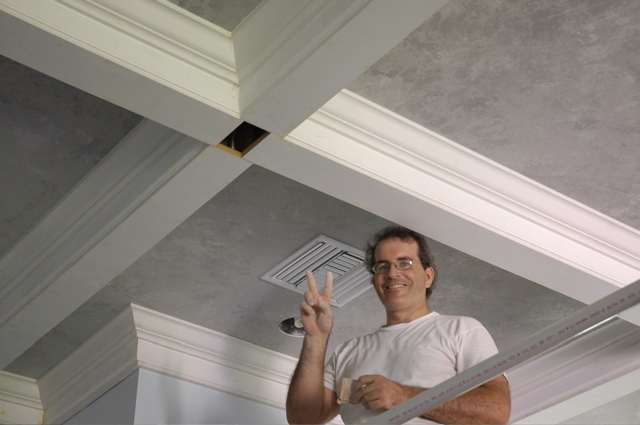 I haven’t put up any carpentry posts so I thought I would start with the coffered ceiling in our house that we’re building. 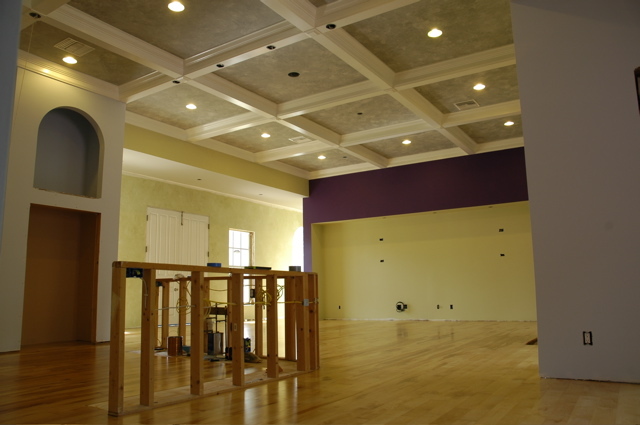 We started with Angi painting the ceiling. Way easier doing it before all the molding went up. Had to rig a safety cage on our scaffolding to give Angi a little more security up there. I rolled her around the room. It took her a good part of a day to get it all painted. Next was to attach all the behind the scenes nailing skeleton. 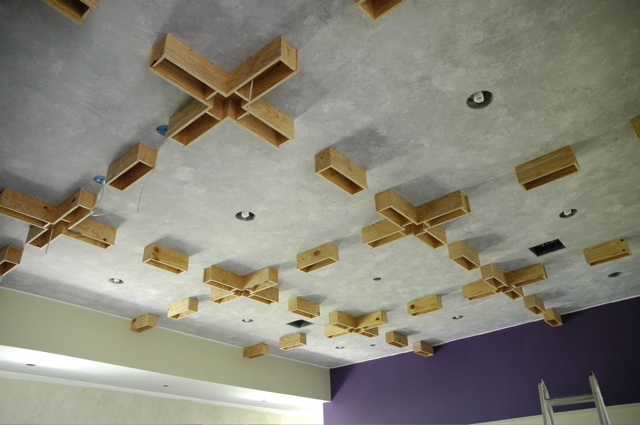 It was all made from 1/2″ CDX plywood making it very economical yet extremely strong. 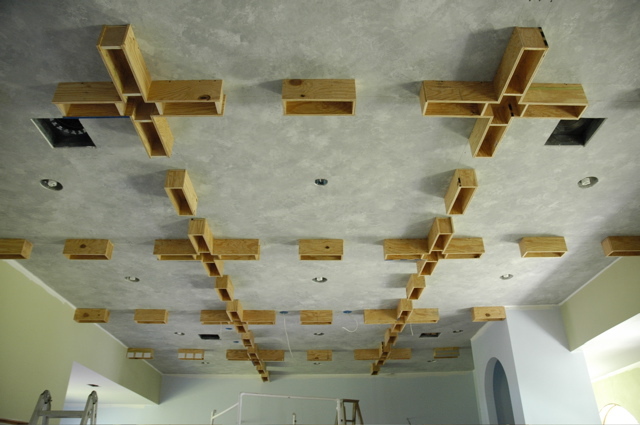 We planed ahead and put bracing in the trusses before we put up the drywall to make attaching these U shaped boxes to the ceiling much easier. Used liquid nails and screws to make the attachments. Here’s a detail of how the molding attached to the nailer’s. 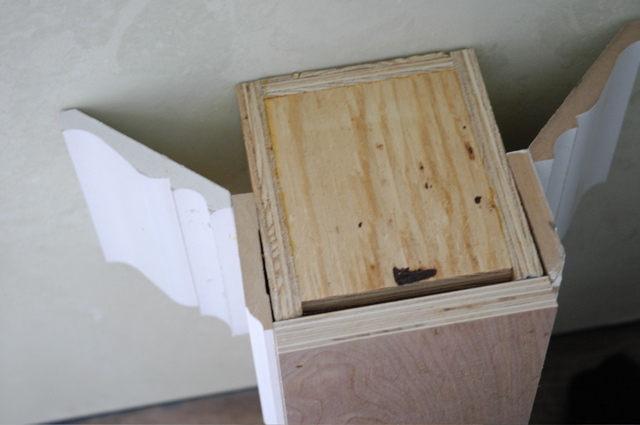 We used MDF for the bottom section not plywood like in the photo. We bought some 4×8 sheets of 3/4″ MDF and ripped them to width with a circular saw and a rip fence. Way safer and easier than using our table saw. We primed it before putting it up to save a step. The rest is made up of relatively inexpensive pre-primed MDF moldings. A 4.5″ baseboard upside down and a 4.5″ crown. 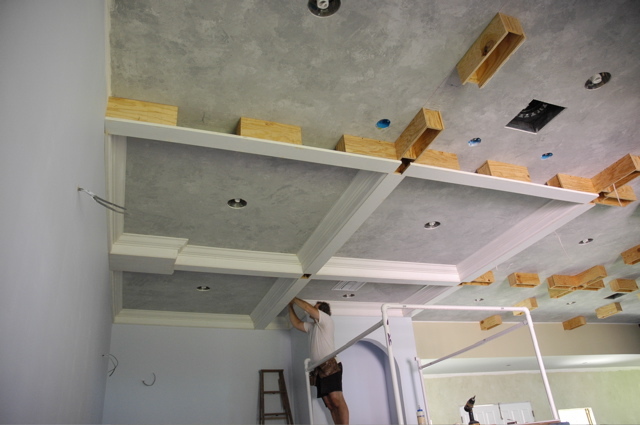 Here’s the first couple sections of molding going up. Shot everything up with a 15ga Senco nail gun, I coped all the joints rather than just doing 45° corners. It meant spending a lot of time with the coping saw but the joints are much better. 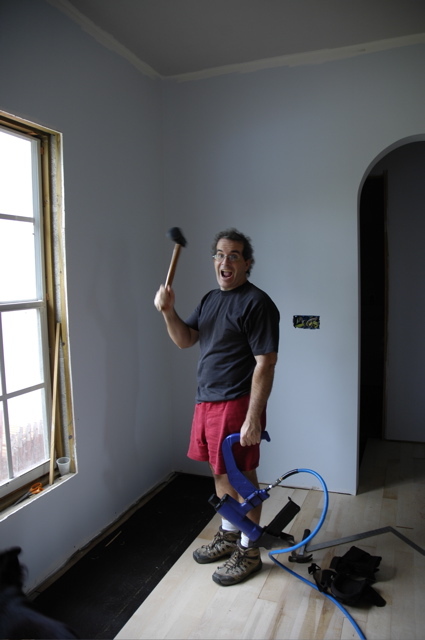 I filled all the nail holes caulked and sanded everything as I went across the room. 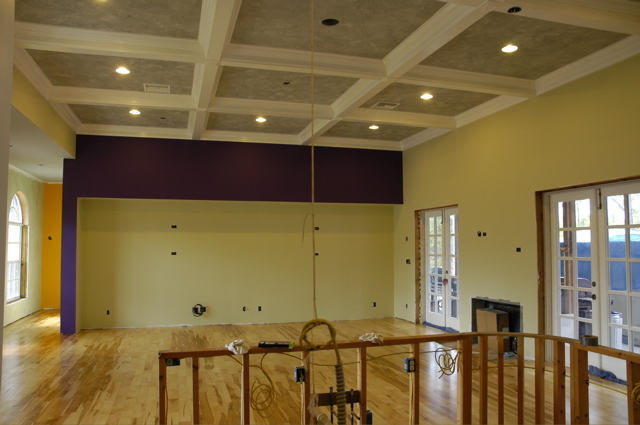 We wanted to get the ceiling done before putting down the floor so we wouldn’t be rolling the scaffolding over the new hardwood. As you can see I had just about had enough when we were almost done. 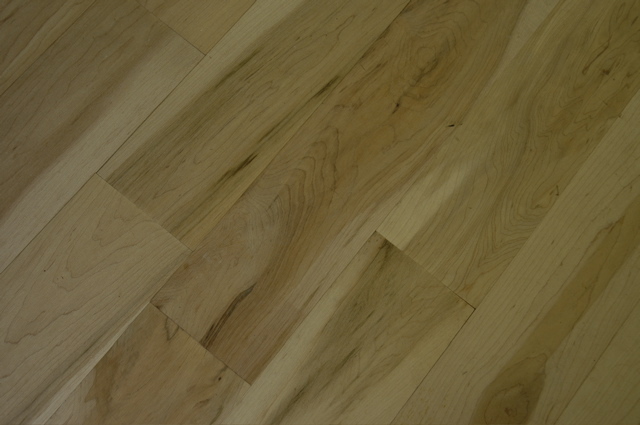 It’s 4″ wide 3/4″ thick cabin grade unfinished maple. Very nice detail and execution of work. I really liked the way you laid out the blocking using per-assembled sections. Great time saver idea. Well done. 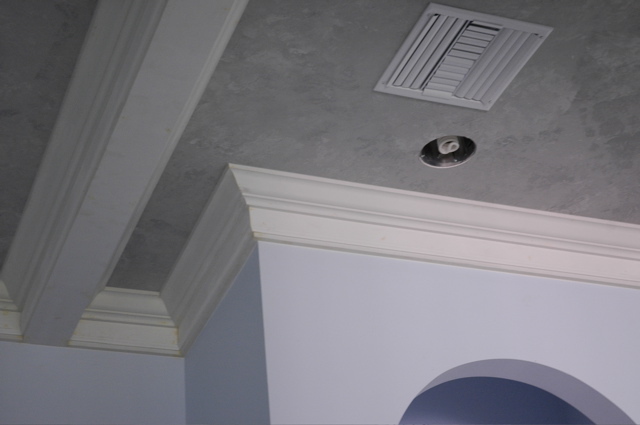 Been having a tough time finding this type of detail on building a coffered ceiling. I wish I could pin this on Pinterest! I love it! I have a cathedral ceiling. It’s huge, and it’s boring! I want to do this two tone blue and ivory. I have a ceiling fan hanging from the center beam and want to build a round base for it as well – perhaps with detail work. Please add a “P” button to your blog?